Your little trick-or-treater will enjoy the sweet smell of success in these adorable costumes! Little boos and ghouls love our exclusive costumes. The high-quality construction, super soft fabrics and easy-on zippers are such a treat! le top kids - Troy The Triceratops Fur Coverall W/ Hood (Infant/Toddler) (Green) - Apparel For the boy who dreams of prehistoric animals, this Triceratops is sure to make a comeback. Enjoy going house to house as the cutest green dino in the land. Make growling sounds by squeezing the right hand. Attached hood with face, horns and teeth. Hands and feet are hidden by mittens and shoe covers. Front zipper opening. 100% polyester. Machine wash cold, hang dry. le top kids - Stripes The Tiger (Infant/Toddler) (Orange) - Apparel It's not the jungle, it's Halloween! ; Fearless tiger is covered in all-over orange and black stripes. Attached hood has the tiger's face and little ears on top. Matching rear tail for fun. ; Zip front for easy on/off access. ; Head is covered except for outline of face. ; Squeeze the hand to activate the 'growling' sound. ; Material: 100% polyester. le top kids - Pinky The Leopard Faux Fur Coverall W/ Hood (Infant/Toddler) (Pink) - Apparel Have them hearing your roar from down the street. ; “Pinky will give her a leopard-printed suit for the look, along with realistic growling sounds made when she squeezes her paw. ; Cute ears and nose can be seen on the fluffy, attached hood. ; Hands and feet are also hidden. ; Easy on/off with zipper closure. ; 100% polyester. Animal Planet Collector's Edition Ring Tail Lemur Infant Costume Includes: One-piece footed coverall and head piece. Animal Planet Collector's Edition Meerkat Infant Costume Includes: One-piece footed coverall and head piece. Animal Planet Collector's Edition White Tiger Cub Infant Costume Includes: One-piece footed coverall and head piece. Animal Planet Collector's Edition Sea Otter Infant Costume Includes: One-piece footed coverall and head piece. Animal Planet Collector's Edition Monkey Infant Costume Includes: One-piece footed coverall and head piece. Floppy the Bunny Plush Costume Includes body suit, headpiece, booties, and toy carrot. Lil' Teddy Bear Elite Collection Infant/Toddler Costume Includes: Lined zippered bodysuit with bow tie, booties and hood with ears. Lil' Lamb Elite Collection Infant/Toddler Costume Includes: Lined plush zippered bodysuit, attached bow, attached tail, booties and lined character detailed hood with ears. Lil' Stinger Elite Collection Infant/Toddler Costume Includes: Lined zippered bodysuit, attached stinger, booties, hood with antennae and detachable wings. Lil' Ducky Elite Collection Infant/Toddler Costume Includes: Lined zippered bodysuit, attached tail, booties and hood with beak and plush top. Lil' Kitty Elite Collection Infant/Toddler Costume Includes: Lined zippered bodysuit, attached tail with bow, booties and hood with kitty ears. Tigger Infant Costume Includes: Jumpsuit with attached hood and detachable tail. Socks not included. Available in Infant size 12-18 Months and Toddler size 2T. This is an officially licensed Disney Winnie the Pooh costume. Lil' Giraffe Elite Collection Infant/Toddler Costume Includes: Lined zippered bodysuit, attached tail, booties; hood with ears, horns and mane. Lil' Elephant Elite Collection Infant/Toddler Costume Includes: Lined zippered bodysuit, attached tail, booties; hood with trunk and ears. Lil' Stinker Elite Collection Infant/Toddler Costume Includes: Line zippered bodysuit, attached tail, booties and hood with ears. Lil' Penguin Elite Collection Infant/Toddler Costume Includes: Lined zippered bodysuit with bow tie, attached tail, booties and hood with top hat. Lobster Infant This cute costume includes: hooded coverall with zip front, attached claw hand covers, and non slip feet. Available in Infant size 12-18 Months. Gorilla Infant Infant Gorilla is adorable in an all-in-one hooded coverall made of polyester and acrylic with a zip front and non slip feet. Fits little ones 12-18 Months. Banana not included, make sure you have plenty of your own! Bear Oatmeal Infant/Toddler Includes: curly plush jumpsuit with plush faux fur tummy and separate hood with ears. Available in sizes: Infant (12-18 months) and Toddler (2-4 years). Baby Butterfly Infant Includes an adorable purple bunting with a contrasting pink tummy, attached hood with antennas and attached light pink and yellow wings. Available in child size bunting 0-6 months. Sheep Infant - Fairytale Classics Includes a jumpsuit with diaper friendly snaps and sheep applique, and separate headpiece with ears. Available in Infant size 18-24 Months. Little Lamb Infant Little Lamb includes jumpsuit, hood, and footies. Available in Infant size 6-18 Months. Cheshire Cat Infant - Fairytale Classics Includes one piece jumpsuit with diaper friendly snaps, separate nose a nd whiskers, headpiece, booties, and mittens. Available in Infant size 18-24 Months. Little Dinosaur Infant Little Dinosaur includes jumpsuit and headpiece. Available in Infant size 6-18 Months. Footies not included. Baby Piglet Plush Bodysuit Infant costume includes: Deluxe Plush Pink bodysuit with attached Piglet character hood. Available in one size: Infant 3-12 months. (Socks NOT included.) This is an officially licensed ©DISNEY costume. Baby Eeyore Plush Bodysuit Infant costume includes: Deluxe Plush bodysuit with attached Eeyore character hood. Available in one size: Infant 3-12 months. (Socks NOT included.) This is an officially licensed ©DISNEY costume. Pink Kitty Your little kitten will be pretty in pink bundled up in this cloud-soft 1-piece. Features an attached hood, zip front, snap legs and tail. Elastic holds lower paws in place. Polyester. Imported. Wonder Pets Linny The Guinea Pig EZ-On Romper Infant Costume Includes: Headpiece and romper with removable cape, inner leg snap closure and nonskid soles. This is an officially licensed Wonder Pets costume. Wonder Pets Turtle Tuck EZ-On Romper Infant Costume Includes: Headpiece and romper with removable cape, inner leg snap closure and nonskid soles. This is an officially licensed Wonder Pets costume. Wonder Pets Ming-Ming Duckling EZ-On Romper Infant Costume Includes: Headpiece and romper with removable cape, inner leg snap closure and nonskid soles. This is an offically licensed Wonder Pets costume. Horse Infant Costume Includes: Romper and headpiece. Does not include toy carrot. 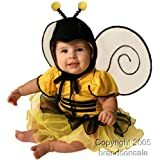 Buzzy Bee Dress with Wings Infant Costume Includes dress and wings. One size fits most Infants. Lady Bug Bunting Costume Includes ladybug bunting with attached wings and hood. Baby Lamb Infant Costume Includes: Bubble outfit with attached hat. Booties not included. Baby Duck Infant Costume Includes: Bubble outfit with attached hat. Booties not included. Chicken Infant Costume Includes: A micro fiber jumpsuit, hood, and foot covers. Little Frog Infant Costume Includes: Jumpsuit, headpiece, and footies. Adorable Dino Infant Costume Includes a one piece bodysuit with tail and hood. Socks not included. Available in Infant size 12-18 Months. Mighty Dino Infant Costume Includes bodysuit and hood. Socks not included. Available in Infant size 12-18 Months. Kitty Infant Costume Includes: Headpiece and jumpsuit. Toy mouse not included. L'il Stinker Infant Costume Includes: Vest with attached tail, hood and booties. Plush Bunny Bunting Costume Includes plush bunny bunting and hood. Toy carrot not included. Ladybug Bunting Infant Costume Includes: Bunting with fabric fastener on back and headpiece. Available in Infant size Newborn - 9 Months. Bumble Bee Bunting Infant Costume Includes: Bunting with fabric fastener on back and headpiece. Available in Infant size Newborn - 9 Months. Bat Bunting Infant Costume Includes: Bunting with fabric fastener on back and headpiece. Available in Infant size Newborn - 9 Months. Penguin Infant Costume Includes: Jumpsuit, hood, and foot covers. Elephant Infant Costume Includes: Romper and headpiece. Does not include toy peanut. Available in Infant size 6-12 Months. Shark Bunting Infant Costume Includes: Bunting with fabric fastener on back and headpiece. Available in Infant size Newborn - 9 Months. Wiggle Worm Infant You'll be the most popular worm at the party in our Wiggle Worm costume! This adorable Wiggle Worm infant costume is sure to be a big hit at your next costume party! This multi-colored worm costume includes flannel bunting and hat with antennas. Fits infants 0-3 months. Lobster Bunting Costume Includes bunting and snap on hood. Fits most babies up to 28 inches tall. Little Pig Infant Your little one can go hog wild in our Little Pig costume. Everyone in the barnyard will be talking about this adorable Little Pig Costume. Includes pink brushed flannel jumpsuit with pig tail, and black cuffs at the wrist, matching hood with pig nose and ears, and matching footies. Available in Infant size 6-18 Months. Blue Lamb Infant With our Blue Lamb costume, your baby will be the cutest in the room! Get ready for some barnyard fun in our adorable Blue Lamb infant costume. Included is a chenille fur and flannel hooded jumpsuit with ears and a blue bowtie. Fits infants 6-12 months. Pink Lamb Infant With our Pink Lamb costume, your baby will be the cutest in the room! Get ready for some barnyard fun in our awesome Pink Lamb infant costume. Included is a chenille fur and flannel hooded jumpsuit with ears and a pink bowtie. Fits infants 6-12 months. Pig In A Blanket Infant Oink! Oink! Our delightful Pig In A Blanket infant costume will be a big hit at the barnyard party! This adorable Pig In A Blanket costume is perfect for your infant's next costume party. This costume features a light pink jumpsuit complete with pig tail, a pig head hood, a blanket, and two (2) hoof-like booties. Be sure to look for our other animal costumes (sold separately) for a great group costume! 100% Polyester. One size fits most infants. As seen in Parent's Magazine! This little cub is fun to cuddle! Your baby will love our soft and cozy Teddy costume! Includes a brown chenille fur and flannel jumpsuit with cream colored torso area and feet, a blue bowtie, hood with ears, and rainbow blanket (not pictured). Fits infants 6-12 months. Baby Einstein Disney Duck Infant an all-in-one bodysuit made of super soft plush fabric with an attached character hood and no skid booties. The embellishment on the chest is a unique sensory design with color and touch to appeal to baby's growing curiosity. Duck Costume comes in infant sizes 0-6 Months and 12-18 Months. This is an officially licensed Disney, Baby Einstein costume. Cozy Little Bunny Cape Infant/Toddler The Cozy Bunny Cape is available in One Size Infant/Toddler (12-24 Mos.) Stockings not included. Lil' Ladybug Infant Costume This adorable lil' ladybug is a red with black spots hooded cape with attached pom-pom antenna, and is made of soft fleece. It comes complete with matching red and black mittens and booties. Pink Bunny Infant Costume nk Bunny infant costume includes chenille and flannel jumpsuit, hat with ears, and carrot rattle. Fits infants 6-12 months. Blue Bunny Infant Hop along to the party in our adorable Blue Bunny infant costume. Your baby will feel soft and cozy in this precious Blue Bunny costume. Includes chenille and flannel jumpsuit with bowtie, hat with ears, and carrot rattle. Fits infants 6-12 months. Chickie Infant This is one colorful chickie! Our infant Chickie costume puts an interesting twist on this traditional costume by adding a cute rainbow colored bonnet. Includes rainbow bonnet, chenille and flannel top, and ruffled pants with attached booties. Fits infants 6-12 Months. Lady Bug Infant Cute as a bug! Includes Red and Black satin lady bug dress with Black net underskirt and matching attached wings. One size fits up to most infants 24 months (Model shown is 30" tall/20 lbs). Little Ducky Romper Infant Plush Little Ducky Romper and has matching hood and webbed booties. Tights not included. Sizes available are: Infant (6-18 mos) and Toddler (2-4). Buzzy Bumble Bee Infant includes: plush bodysuit with front zipper, attached hood with fuzzy moldable antennas, and iridescent wings. (Socks NOT included.) 100% polyester, exclusive of trim. One size: Infant 3-12 months. A costume as cute and cuddly as your baby! Baby Bee Bunting Infant Adorable black and yellow on top, black on the bottom, black wings and a hooded antennae make baby's first costume too cute. Newborn Bunting fits babies 0-6 months, height- 20"-25", and 7-15 lbs. Baby Clownfish Infant Includes an orange and white striped bunting with black piping, stitched 3D tail and hood. Available in child bunting, 0-6 months. Engineer Bear Infant This adorable Engineer Bear costume includes: hooded train engineer coverall with zip front and non-slip feet. Available in Infant size 12-18 months. This Lil' Bee is a sensational soft fleece hooded cape in black and yellow with attached pom-pom antenne comes complete with matching mittens and booties. It fits Infants sizes 3-12 months. Lil' Honey Bumble Bee Costume Includes jumpsuit with front zipper, attached wings, separate headpiece. One size: 12-18 Months. Baby Spider Infant Includes a plush polyester grey and black vest with attached legs and spider, and a matching spider hat with antennas. Shirt, pants, and shoes not included. Ricochet Rabbit Bunting Plush White faux fur bunting with attached feet and tail comes with separate character headpiece, both with pink accents. Back Velcro opening for easy diaper changes! Available in one size, 0-6 months. Petite Panda Infant/Toddler Costume Includes: soft plush bodysuit and attached character hood done with incredible workmanship. Sock's not included. Fish Bunting Costume One piece tunic with snap on hood. One size fits up to most 24 months, or up to 28 inches. Baby Bear Infant - Fairytale Classics Includes a one piece jumpsuit with diaper friendly snaps, plus an added bonus that includes a red and a pink tee shirt, pink headband, and red bowtie for boys and girls. Available in Infant size 18-24 Months. Brave Little Dalmatian Cape Infant/Toddler This Dalmatian Cape is a one-piece. Stockings or booties not included. Available in One Toddler size 12-24 months. Baby Fearless Lion Costume Lion - Baby Costumes includes the chenille and flannel lion costume jumpsuit, animal costume hood with yarn fringe and the mittens. Baby Magic Pony Costume - Baby Costumes includes the chenille and flannel pony costume jumpsuit with animal costume hood and yarn fringe. Baby Leopard Costume - Baby Costumes includes the leopard costume romper and headpiece with hidden sound chip that makes animal sounds! Plush Puppy Baby Costume - Baby Costumes This Plush Puppy Baby Costume includes headpiece and romper jumpsuit with inner leg snap closure and nonskid soles. This baby costume comes with easy on and off snaps! Cozy Cow Baby Costume - Baby Animal Costumes includes the headpiece and romper with inner leg snap closure and nonskid soles. Parrot Baby Costume - Baby Animal Costumes The Parrot Baby Costume for newborn and infant includes the headpiece and romper with attached foot covers and inner leg snap closure. Baby Monkey Costume - Baby Animal Costumes ncludes the headpiece and the Monkey Costume romper with inner leg snap closure and nonskid soles. 100% Polyester. Hand wash with cool water. Line dry. No bleach. Ideally, the size Newborn (0-9 months) will best fit most babies from 3 to 6 months old. Dalmatian Baby Costume - Baby Animal Costumes includes the hooded dalmatian costume cape, the mittens & the booties. Little Bat Baby Costume - Baby Halloween Costumes includes bat costume headpiece & bat baby costume jumpsuit. This Li'l Bat Baby Costume features easy on leg snaps. Little Kitty Cat Baby Costume - Baby Animal Costumes includes the hooded cape, mittens & booties. Hatching Chicken Baby Costume - Baby Animal Costumes includes the headpiece with romper with inner leg snap closure and nonskid soles. Baby Little Bunny Costume - Baby Animal Costumes includes the hooded cape, mittens & booties. Size is 3 to 12 months. This Caped Cutie Costume will be sure to bring on many, Oh, what a Cutie Pie. Penguin Baby Bunting Costume - Baby Animal Costumes includes the Penguin costume bunting. Baby Spider Costume - Baby Costumes includes the animal headpiece and the spider costume romper with inner leg snap closure and nonskid soles. Baby Frog Costume - Baby Costumes includes the frog costume headpiece and animal costume romper with inner leg snap closure and nonskid soles. Baby Lion Around Bunting Costume - Baby Costumes a bunting style costume and is available in size Newborn and fits most babies 0-9 months. Baby Bunny Costume - Baby Costume Bunting is a one piece baby bunny costume bunting with attached bow tie, tail and ears. 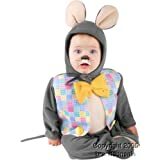 The baby bunny costume is available in size Infant. Baby Cow Bunting Costume - Baby Costumes Includes Baby Cow Bunting costume with velcro bottom and the headpiece. Fits newborns up to approximately 9 months. Eeyore Infant Costume 0-6M Don't pin the tail on this donkey! He's one of Winnie the Pooh's best friends. Costume includes bodysuit with front snaps and attached character hood. Available in sizes: 0-6M and 12-18M. This is an officially licensed Winnie the Pooh ©Disney costume.